We have all been there; meetings where the loudest voice gets their ideas voted in, family outings where your instructions need to be bellowed for before the kids react, partners who really don’t “get you”. Here is an exercise I use with my clients which could help you get heard the next time you are in danger of straining your vocal chords. 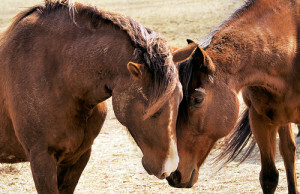 “We set the two horses loose and they trotted away from us, then each looked for a place to roll. Choosing a good spot was crucial, followed by turning on the circle, and finally bending their knees and lowering themselves onto the sandy ground. The roll was heaven, a massage for the back and a good stretch for the muscles. One horse then stood up and shook herself, the younger one jumped up and bucked then pranced around. This horse circled the other, trotting, trying to entice the older one to join in, but she was having none of it. Just wanted to do her own thing. Her movements were measured, she drifted around, sniffing the ground, feeling the air, taking her time. The younger horse began to copy her, stepping at the same pace, moving her body in the same way. They both stopped at the same moment and looked in the same direction. And what does this show us? Why use this form of coaching? My client had come to me with feelings of low self-esteem, sometimes not understanding why people reacted to her in certain ways. Observing the two horses together showed how nuanced none verbal communication can be, tiny changes in body language can speak volumes. We were able to talk about her communication style, she began to understand that she has influence on other people, they react to her unconscious thoughts, even when she feels she is hiding her true emotions. It was a first step. does this resonate with you? get in touch and we can arrange an introductory session.